This healthy dip will be a hit in your household. 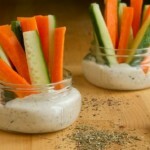 Drop spoonful’s of the dip in jars, top with veggie sticks and serve as a healthy afternoon snack. Begin by mashing the goat cheese with a fork, in a medium-sized bowl. Once mashed, add mayonnaise and lemon juice. Drop in dried herbs and stir to combined. 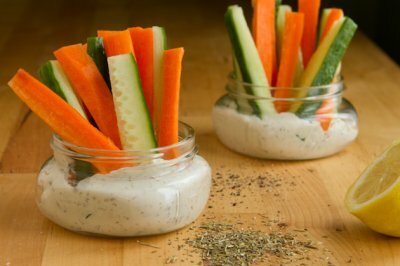 Serve with a large veggie tray for a healthy snack, or drop in jars for a fun twist on a classic favorite! Dairy-free alternative: use 1/2 cup of dairy-free yogurt.